For Houston residents, the most pressing concern surrounding the landscape tends to be whether there is sufficient water, but insect infestations can also cause problems. Pine beetles in particular affect areas across the country, including Texas. There are several different sub-species of pine beetles found in various areas and in Houston they are typically southern pine beetles, the variety that affects the southern portion of the United States. Within the southern United States, the southern pine beetle, sometimes abbreviated as SPB, is considered the most destructive of all forest insects. Despite this title, it has been known to cause destruction in urban environments as well, including Houston. Each outbreak of the beetle will usually last between three and five years. Pine engraver beetles may also infest Houston trees. The southern pine beetle is usually about an eighth of an inch long and has a cylindrical body with black to reddish-brown coloring. The life cycle consists of the egg, larva, pupa, and adult stages, and can last between 26 and 54 days on average, with faster development during the summer months. At any given moment, there will be southern pine beetles in each of these stages found within Houston as the generations overlap. Females land on a mature tree at a height between 6 and 30 feet. After landing, they will bore into the treeâ€™s bark, creating galleries where they mate then lay eggs. When the grubs develop, they are legless and yellowish white and will eat the treeâ€™s inner bark. During this process, they enlarge the tunnels and as they mature, they go to treeâ€™s outer bark, where they become pupae. Upon reaching adulthood, the southern pine beetles will chew through this bark, leaving a small but obvious exit hole. The process of adults leaving the tree can last a long time and in most cases, they will simply move to a nearby tree. The problem for Houston homeowners is that when an adult finds a new host tree and is successful, they create a chemical scent to attract other beetles, leading to a potentially large infestation. There are some trees which are normally resistant to a pine beetle infestation, including eastern white pine, long leaf, and slash. Each of these has an exudate high in resin that protects against the beetles, but if there are large enough numbers of the beetles, even these resistant tree species may develop an infestation. You are more likely to notice an infestation on trees which are weak and mature, such as those over 15 years of age but with a trunk measuring under 6 inches across. In addition to southern pine beetles, the Houston area also sees attacks by pine engraver beetles. Like southern pine beetles, this kind will also typically attack weakened, damaged, or stressed pine trees and usually select those that are alone or in groups of five or fewer trees. When a tree is attacked by pine beetles, it may resist the first attacks, but as the infestation grows, it will undergo more damage. Eventually, hundreds to thousands of beetles will attack, overwhelming the natural defenses of the tree and leading to its death. If you think you have a pine beetle infestation on your property, your best choice is to contact an arborist as soon as possible. This will give them time to determine whether you do in fact have pine beetles and offer the ideal solution before the infestation grows. An arborist has the training and experience to recognize the signs of a southern pine beetle infestation. Most pine beetle infestations will begin around the treeâ€™s mid-trunk area before it spreads along the treeâ€™s length. From the top, you will notice that infested trees have crowns that are reddish brown as opposed to the green needles of their neighbors. They will also have running pitch, white pitch tubes, numerous emergence holes from the adult beetles, tunnels underneath the bark in S-shapes, and/or sawdust around the treeâ€™s base. Because all types of pine beetles tend to attack trees which are unhealthy or injured, you can help protect the trees on your property by keeping them healthy. If some of your trees are experiencing an outbreak, then try not to prune your healthy plants at that point as this will produce smells that attract other beetles. 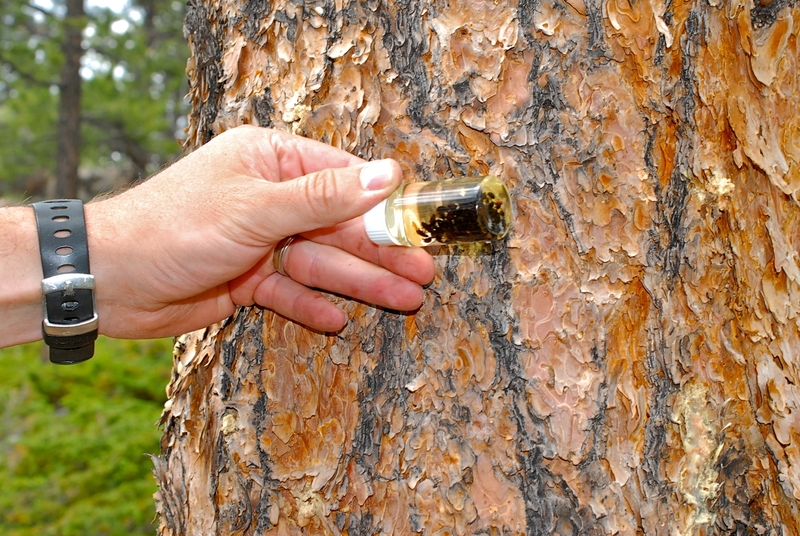 In cases when there is a strong pine beetle infestation, you can also use an insecticide by applying it to dry bark where it runs off, traveling from the ground to the base of the treeâ€™s crown. Keep in mind, however, that this method is solely preventative since it doesnâ€™t penetrate the bark; in other words, it wonâ€™t affect beetles that are already present. Talk to your arborist about the ideal pesticide to use to take care of pine beetles without harming humans or wildlife. It may be challenging to find an appropriate pesticide by yourself, requiring you to consult with an arborist for help in any case. In some cases, an uninformed person may suggest a systemic insecticide for pine beetles. This type of insecticide is either absorbed by the roots or injected directly into the tree instead of being sprayed on the tree. This allows it to work on existing infections, but injectors will frequently fill with pitch or pine resin, stopping the insecticide. The insecticide also tends to travel up to the treeâ€™s top as opposed to the inner area. If you already have trees on your property that are severely infested with pine beetles, your arborist will most likely suggest removing and destroying them and can even suggest someone to perform this service for you. In some cases, you may even be able to salvage some of the trees, meaning sell a portion of them to loggers. Keep in mind, however, that while removing the tree infested with pine beetles, you must avoid damaging other trees as this will increase their chances of infection.